When shopping for your roast beef dinner recipe, choose the right cut of meat to produce a moist and tender roast, such as Rib eye roasts, top loin roast or rib roasts. Used for large, tender beef cuts. The best cuts for roasting are obtained from the loin and the rib. In order to properly roast a cut of beef, it should be placed on a rack in a roasting pan that is not too deep and cooked, uncovered, in a preheated oven on high heat. Some beef cuts are seared before they are roasted. Searing is a process in which the meat is browned quickly on all sides before it is roasted to create a flavorful crust. made with Rib eye roasts, top loin roast or rib roasts. Cut 8 small slits around roast and stick inside each slit a piece of garlic, sprig rosemary, and butter. Rub this mix all over the roast. Place the prepared roast in a pan with a rack. When oven has heated put the roast in for 45 minutes. Begin checking the temperature of the meat with a meat thermometer. Continue roasting the meat until the internal temperature has reached 5 or 10 degrees below the desired doneness. I use for a guideline of 15 to 25 minutes per pound. 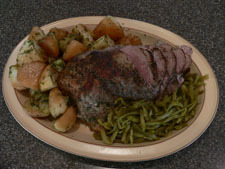 Remove the roast from the oven and place aluminum foil tent over the meat to hold in the heat. Let the roast stand for 15 minutes. The temperature will continue to rise 5 or 10 degrees. Allowing the meat to rest for 15 minutes after cooking will give the juices time to redistribute making it more tender and easier to carve. If you cut into the meat as soon as it comes out of the oven, all the juices will run out, and your meat will be dry. After a resting period the internal temperatures should be in this range. Chop and prepare all ingredients. Preheat oven to 250°. Trim fat from meat, sprinkle with salt and pepper. Heat 2 Tbl oil in Dutch oven. Add Beef and brown on all sides. Remove from pan. Add Remaining Tbl of oil, onion,carrot,celery and parsnip to pan. Saute until lightly browned, about 8 min. Add Garlic, mushrooms,chili powder and cook 3 min. Add broth, tomato sauce, red wine, thyme and bay leaves. Return meat to pan, Bring to boil. Cover the pot and place in oven to cook 4 hours till beef is tender. You should have lots of liquid to make a rich brown gravy. 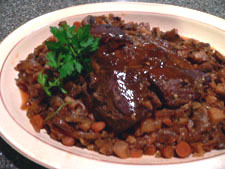 When roast has reached the right temperature, remove the meat and vegetables from the pot to make your gravy. Dissolve cornstarch in cold water and pour mixture into pan with liquid, stirring constantly until thickened nicely. When removing meat and vegetables to separate dish, keep covered with foil to stay warm or use a dish you can put back in the warm oven. You can always transfer meat to a serving platter once the gravy is ready.